Alastair Seeley and Michael Dunlop carry the weight of expectation of Northern Ireland success at this week's North West 200 international road race. Ten-time winner and lap record holder Seeley, 34, rides Kawasaki machinery for Mar-Train Racing in the Superbike and Superstock classes, but switches to a Yamaha for the Supersport outings. 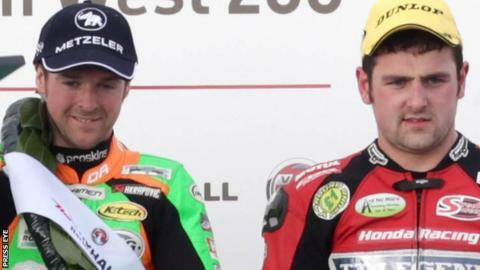 Dunlop, 25, hopes to add to his tally of two successes on the high-speed nine-mile Triangle circuit. Fans of the Ballymoney man will hope that he has overcome the effects of an arm injury sustained in qualifying for the opening British Superbike round at Brands Hatch last month, which subsequently required surgery. The seven-time TT winner has been undergoing intense physiotherapy in a bid to be fully competitive. Dunlop rides in the colours of BMW in the bigger capacity classes and also campaigns a 600cc Honda and a Kawasaki supertwin. Meanwhile, Michael's brother William heads the Tyco TAS Suzuki challenge, along with the ever-popular Guy Martin, who is still chasing his first North West win 10 years after making his debut. William's best chance of victory should come in the Supersport class, but he is also hopeful of making an impact in the showpiece Superbike races, which will run over an extended distance of seven laps this year. Comeback man Ryan Farquhar will harbour ambitions of making a dream comeback in the Supertwins class, where he will be joined by illustrious KMR Kawasaki team-mates Keith Amor, also emerging from retirement, and last year's winner Jeremy McWilliams for the two four-lappers. Among the other Ulster hopefuls are Hull-based Fermanagh man Lee Johnston, who has two podiums on his CV, and Irish Supersport and Supertwin champion Jamie Hamilton on Wilson Craig's ultra-fast Hondas. In the absence of former North West regular Cameron Donald, the Antipodean challenge will be spearheaded by Australian British Superbike star Josh Brookes and nine-time winner Bruce Anstey. Laid-back New Zealander Anstey remains with the Padgett's Honda team for the fourth consecutive year, while Brookes is aboard Yamaha Superbike and Supersport bikes supplied by Shaun Muir's Milwaukee Yamaha outfit. Brookes, who lies second in this year's BSB championship following a race two win at Oulton Park on May Day, makes his second appearance at the seaside course hoping to improve on his seventh place in the Superstock category last year. Hotly tipped for at least a podium this year, Brookes sits out the Superstock outings this time round. He is joined in the official Yamaha team by fit-again Yorkshireman Ian Hutchinson, who was forced to sit out last season after undergoing further surgery on his seriously damaged left leg. A winning return to action at the Macau Grand Prix in November will have given the 34-year-old a big confidence boost as he aims to increase his record of two North West 200 triumphs, both in the Supersport class. John McGuinness's participation was put in doubt after he suffered a broken scaphoid in an off-road motorcycling accident, but the 'Morecambe missile' will be confident of making an impact on his now customary fleet of Honda machinery after a successful test at Castle Combe last week. Fellow 42-year-old Michael Rutter pilots BMW bikes in the 1000cc classes in 2014 and also makes a rare appearance in the Supersport races on board a Triumph. The Midlands man is the most successful rider still competing at the event with 13 wins and nine Superbike successes to date. Others flying the flag for England include Riders Motorcycles-backed BMW racer Martin Jessopp, Quattro Plant Kawasaki entry James Hillier, Lincolnshire lad Gary Johnson, up-and-coming Bradford star Dean Harrison, fastest ever newcomer Simon Andrews and notable debutant Peter Hickman. Manxman Conor Cummins is another looking to break his duck on the north coast and he has linked up with his fourth different manufacturer in four years as he joins McGuinness under the official Honda awning. Diminutive Scot Stuart Easton has the advantage of having to set up just one bike and is a potential winner in both Superbike races in which he runs for Paul Bird's Rapid Solicitors Kawasaki team. The 30-year-old reigning British Supersport champion has a best-ever finish of second in the second Superbike race in 2010 and has bounced back in remarkable fashion from a major practice crash on the Cromore section of the course three years ago. Roads close for practicing from 09:15 BST to 14:45 BST on Tuesday 13 May and Thursday 15 May. Roads close for racing from 17:15 to 21:00 on Thursday and from 09:30 to 19:00 on Saturday 17 May.